APRIL 2015, HIGH POINT, NC - What do you get when you blend a traditional European pedigree with industrial elements such as chain-link motifs, blackened iron hardware and metal grills, along with luxurious touches like silver leaf and sequins? 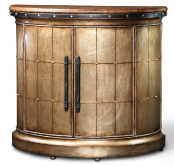 The elegant yet industrial and rustic yet sophisticated Cross Channel Collection from luxury home furnishings brand Marge Carson, debuting here at the April 2015 High Point Market. Just as the English Channel connects Great Britain to France and the rest of Europe, so the Cross Channel Collection connects the continents with an all-encompassing European inspiration including Northern Italian, Spanish, French and English. The result, said Director of Design Christine Rendino, is a "casual traditional collection that lends itself to a deconstructed industrial loft look with a backdrop of brick walls and reclaimed wood." She added, "We drew inspiration from all aspects of traditional Europe. When I look at Cross Channel, I envision London during the Industrial Revolution with its grittier elements. Cross Channel also speaks to Marge Carson's strength in creating a hybrid style. The collection is a bit edgy in a masculine, casual traditional way." The two new finishes in the 35-piece Cross Channel Collection, a grayed-brown Sandalwood and a glamorous silver leaf with bronze wash called Bronze Silver, tell the story of rustic elegance. The new hardware, Blackened Iron, gives a gritty, industrial punctuation mark, and tactile fabrics combine natural, neutral textures with luxury touches such as a metallic glaze and silver sequin accents. Cross Channel: a collection that is both elegant and edgy to resonate with today's style-conscious furniture shoppers. The signature poster bed in Cross Channel is a modern, cleaned-up take on a traditional poster bed with a hint of sophisticated industrial accents. Beaded metal trim detail is included in a bracelet effect around the top of the posts just below the finial. The bed has "headboard-only" posters with a clean and simple low footboard. The round dining table perfectly embodies the marriage of European elegance with industrial inspirations. A forged metal chain-link motif encircles the base of the table in a champagne-colored finish.  The same motif is repeated in the inlay of the tabletop. 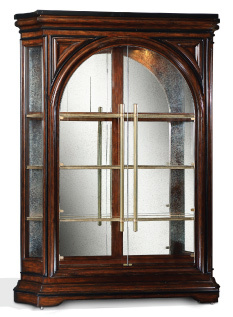 At 70 inches wide and 95 inches tall, the Cross Channel display cabinet has an imposing presence. The antique mirror back is an elegant, glamorous touch, while the long bar hardware made of distressed brass and the metal frames on the shelves bring in the industrial flair. French curves on the apron and cabriole legs are married to a glass table top revealing a gate-like metal grill pattern beneath. Again, the end table is a perfect pairing of European elegance and edgy industrial influences. 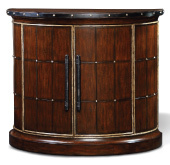 Like the round dining table, one of the cocktail tables has a bracelet-like, metal chain-link motif that encircles the piece. 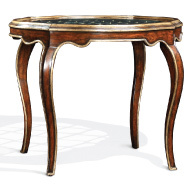 The other cocktail table features elaborately-curved French legs and a shaped top and is finished in the glamorous silver leaf finish with bronze wash, Bronze Silver. 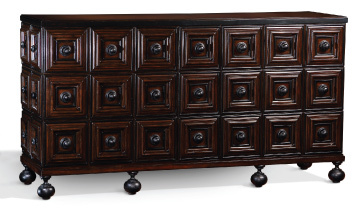 An abundance of deeply moulded apothecary-like drawers are accented by Blackened Iron hardware and metal bun feet for a piece filled with character. 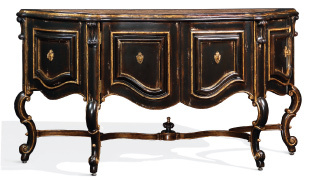 Offered in both a painted black finish with gold trim and the Bronze Silver finish, the credenza is in a traditional French silhouette, yet overscaled for a more masculine, dramatic presence. Scored wood, long iron hardware and a strip around the top perimeter accented with metal studs give this piece an industrial and Italian design vibe. 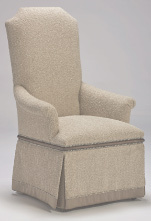 Skirted arm and side host chairs have a metal base. The upholstery is a quilted linen and chenille boucle with tiny silver sequins woven into the fabric for a touch of luxury. Many of the fabrics for dining, side chairs and sofas are natural, neutral and textured with a hint of glam through silver metallic threads.